What were the twelve modes? The first eight modes were designated in the medieval era, as a way to classify pre-existing Gregorian chants. The next four were added by Glareanus in 1547. This gave way to our modern system of tonality, especially via the Ionian mode. The most important note of a mode is its "final" or the note on which it cadences. The finals will be emphasized typographically below. This is important because the modes come in authentic and plagal pairs. In the authentic modes, the final is the lowest note of the mode's scale, whereas in the plagal modes, the final is the fourth note. Convenviently, the scales for these modes are easily represented (aside from issues of tuning) by the white keys on the modern piano, simply by starting from different notes. Today they are sometimes called "the mode on D" etc. For those readers unfamiliar with Western music and its notation, it should be mentioned that each of these notes is not the same distance apart. In particular, the pairs E & F and B & C are separated by only half of a full tone, or a semitone. This gives each of these modes a characteristic sequence of intervals, or whole- and half-steps. In addition, there is some inherited sense of absolute pitch in the definitions above based on modern scales. Medieval modes would have been based on the hexachord system of Guido d'Arezzo (d.c.1050), in which there is also a sense of absolute pitch, but a less specific one. Although the intricacies of linked hexachords are beyond the scope of the present article, the addition of modes IX-XII does show a definite shift from the hexachord system, as they are not obtainable by normal hexachord mutation. The primary point to this diversion is that one could indeed construct any of these modes on a different note of the modern scale by employing accidentals (as is so typically done with the Ionian=major & Aeolian=minor modes), but the starting values above are historically significant. They were not real modes for Renaissance music, on the theoretical level, due to the fact that the F above B is a diminished rather than a perfect fifth. They have an existence today primarily in Jazz. As a final note, connecting the Greek names of these modes to Ancient Greek theory or any other tangible existence in Greece is dubious at best. The origin of the names is a sort of historical homage. Modal thinking changed very slowly, over a matter of centuries, encrusted with tradition and conservatism but driven by the application of musica ficta. I can find songs of the 13th century which are clearly in a major mode, notably the famous "Sumer" canon, and for that matter some of the 12th century music of Hildegard von Bingen has sections that are major rather than following the theoretical church modes. 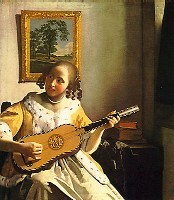 For broad brush strokes, I generally teach that church composers trained in the Northern European Renaissance style retained their modal way of thinking through the end of the 16th century and, for the more conservative, the beginning of the 17th, even if their secular music was already moving in different directions. Monteverdi is a key figure, knowing and using both the older and the newer musical styles with equal skill, but his music still does not fall under a clearcut non-modal definition. The historical beginning of the fully-realized major-minor system is generally identified with Corelli's first publications in the 1680s. The first serious attempt at theoretical explanation was made by Rameau in 1722.